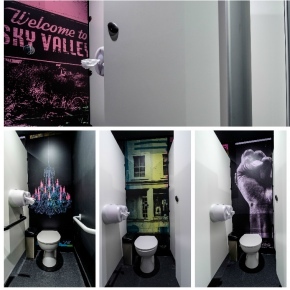 Washroom’s solid grade laminate Mezzo toilet cubicles were manufactured in a vibrant shade of pink for the new art-inspired Crate Loughton in Essex. The new office development features 36 creative workspaces designed to meet the needs of the modern business and all housed in repurposed shipping containers. Washroom’s white SGL Mezzo toilet cubicles are designed to show off the unique artwork on the duct panelling in each toilet cubicle at the Borderline Club in Soho. Washroom’s Iconica Collection offers exclusive designs, materials and finishes, developed especially for high-specification commercial washrooms, shower and changing areas. Washroom offers a range of colours, finishes and materials to choose from plus the option to spray paint cubicles to any RAL colour and incorporate bespoke design features.